Computational Fluid Dynamics (CFD) provider Meteodyn and wind lidar company ZephIR Lidar have collaborated to produce a packaged “white box” solution, where the different stages of processing are clearly visible to the user. This addresses the challenge of taking lidar wind measurements in complex terrain. Data from lidars are now widely considered as being bankable for use in wind resource assessment campaigns. The recently published IEC 61400-12-1 ed.2 introduces guidance on how to deploy a lidar for the purpose of wind turbine power performance testing. Remote sensing devices calculate a mean wind speed vertically above the sensor location on the basis of measurements around a scanned area that typically encompasses a diameter comparable to the measurement height. Uniform flow ensures that measurements around the circumference of the sampling disk are representative of the wind speed at the scan centre in benign terrain. The averaged wind measurement is comparable to traditional met mast anemometry measurements allowing lidars to be used in standalone operation without the need for additional on-site anemometry during a wind resource assessment campaign. In strongly non-uniform flow, for example in complex terrain, measurements are often not the same across the scanned area and wind speeds measured by remote sensors will not necessarily be comparable to that experienced by traditional anemometry at the scan centre. A similar effect would be seen if comparing two met masts spaced some small distance apart in complex terrain – they are simply measuring different conditions that depends on their precise location. Meteodyn and ZephIR Lidar have conducted a validation study lasting more than 18 months utilising multiple years of data in order to deliver a white box solution when taking measurements in complex terrain. By using Meteodyn WT in complex terrain, a set of ‘factors’ can be computed that enable the conversion of measurements from a bankable ZephIR 300 wind lidar into comparable point measurements similar to those from conventional anemometry. This auditable white box process enables the traceability required by consultants for continued project financing based on data from ZephIR 300 alone by reducing the uncertainty between remote sensors and traditional anemometry in complex terrain. Meteodyn develops applied meteorology software (wind, solar energy), custom distributed and collaborative software platform including our renewables expertise. 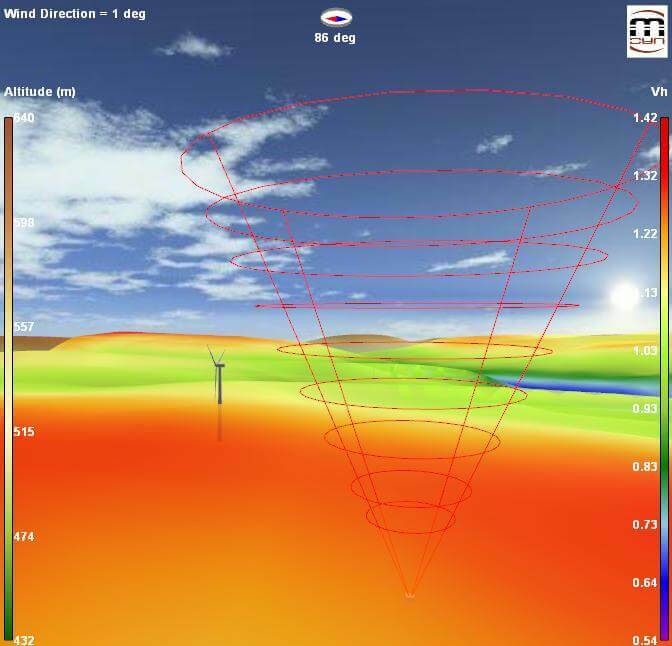 meteodyn WT is the world CFD software leader for wind resource assessment in complex terrain. Based on our successful experience in the wind industry, we’ve developed meteodyn PV – solar resource assessment and solar plant design software. Our R&D team develops cutting edge wind production forecasting systems and O&M tools tailored to customer’s needs. From measuring campaign, potential studies, bankable reports to operation and maintenance efficiency, we support the wind and solar industry at every step of their projects. Moreover, Meteodyn provides software and studies to city planning and green building consultants: pedestrian climatic comfort, energy performance of buildings, energy yield assessment in urban areas. Finally, Meteodyn carries out wind loads studies related to safety of high speed train, tall buildings and civil engineering structures, tower cranes, leisure and sporting areas that may be subjected to strong winds.